For a variety of reasons despair is in the air. Scandals, missile launches, terror attacks – and on top of it, the Dolphins signed Jay Cutler. I need a day for a repeat, this from five years ago. I worked for a while with my Amish “cousins” and I have to tell you I enjoyed it immensely. Here’s why. The journey starts at the funeral for my Grandmother, Arletta. I was a punk kid from Miami not at all used to the damp cold of a Pennsylvania January nevermind all the relatives who drove junk cars and spoke with a deep accent. Truth be told, as much as I loved my Grandma I was worried about missing the next day’s Superbowl, Dan Marino’s first appearance with the Dolphins. There was a lot going through my mind as I had to sit quietly waiting for the service to start. My Mom broke the whirl of contemplation in her usual quiet way. “You see those people over there, in the plain dresses and hats and prayer caps?” I nodded, they were damned hard for me to miss. “They’re your second cousins.” What? I have relatives in the 17th Century? I’d like to say what direction my thoughts went from there, but I can’t tell you. Suddenly, a whole lot of things made sense. This was the first time it sunk in that my Grandfather had left the faith, Santified Bretheren but Amish as a decent shorthand for us Englischers. I was one of … them. Things you never see. But should you? Today is the big company picnic for the operation I proudly signed on as an employee of, erikorganic.com. It was started by my good friend Erik Schimek, a hard working man with a greatly expansive mind with whom I worked with before in the same community. We sell furniture made by the Amish community of southern Minnesota, a group who after comparing notes are clearly distant cousins of mine. The small bits of Plattdietsch I learned around my Grandma has served me well over the years as we work to bring their crafts onto the internet. I was brought on to tighten communications between the cultures and centuries, connecting our craftsmen to our customers in some new and exciting ways. Social media had better damned well look out once we get this going. Driving down to the twisted roads is more than a two hour journey I take weekly. It’s a gentle careen through the helices of my own DNA, over rough hills soften by time that take the shape of the odd language deep in my guts. It’s a trip through time and life itself, into a pastoral world that defies easy description. It leaves me silent under the roar of my own junker car, the passage of time sinking deeper inside than I’m actually comfortable with. 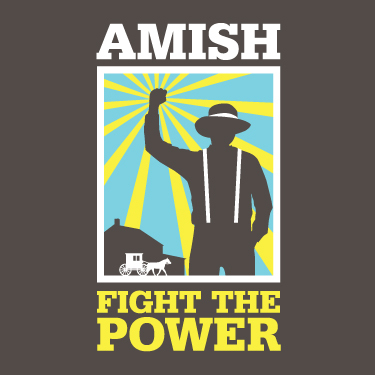 Our company picnic is a catered affair when we all get together, across three Amish communities that include our craftsmen working out of small shops on their farm. It will be a long loafing day with visiting and eating, the simple joys of the end of the summer. This is something that I never explain to people until they know me. I grew up in a very different place, one impregnated with violence and slipping gradually into a culture of post traumatic stress disorder – a disbelief in our own world. Miami in the early 1980s could not be any more different than the world our people came from. Literal Bible reading with the words of Jesus in red never made much sense until the winding road in my own mind started that January day when Arletta became one with the red clay of Lancaster County, Pennsylvania. It all comes out in strange, inexplicable ways. When my sense of Romanticism pops to the surface it usually comes out in Revolution, not pastoral bliss. The only good joke I have is that if you knew my family history, living in the 19th century is actually progress. Things out of harmony with the simple passions of time passing are filed away as simply not “right”, a gut reaction that may or may not deserve a mention to the rest of the world that would require so much explanation. It’s an inside joke, either you get it or you don’t. Nevermind. There’s no point to the post today, except to tell everyone that I’ll spend the day visiting with my distant cousins and practicing up on Plattdietsch through a mouth full of food. If I’m lucky, I’ll find someone who can make me a few banded collar shirts that I love so dearly, the plain ones that fit square and hang with an awkward confidence. What I hope, more than anything, is that my ability to stand a strong half-step back from this world, far enough for some perspective but close enough to keep my hands dirty, will be reinvigorated. As I learned 30 years ago, these are my people. Not a lot else matters in the end, even Dan Marino appearing in a Superbowl – and strangely enough he never did win one. This entry was posted in People & Culture and tagged amish, Brethren. Bookmark the permalink.